Trinity Designs: "Mr. Twigster is Sooo Cute!" I am quoting my friend Kelly who has discovered a new 'snow'man in her life! And I do agree with her - he is just adorable with his little twig legs and cute little boots! He's even more adorable when he is stamped and colored in! 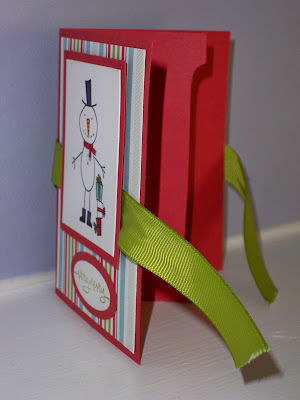 This simple gift card holder idea came originally from a swap I was in last spring - remember "Tart and Tangy"? yeah, another way cool stamp set. Well, I got a swap card using that set and it was this design for a gift card holder. So, needing to create for a party I did recently (Hi Suzi and gals!) I designed this little goodie! The best part is that it is as easy as it is cute! I started with a 1/2 sheet of Riding Hood Red cardstock cut at 4 1/4" x 11". It was scored from each end at 3 1/4" and again in the middle at 5 1/2". Once scored, it was folded into the shape of a "W". The bottom points of the "W" are adhered together with Sticky Strip. slot for the gift card to fit into. Just don't punch all the way to each side - kind of defeats the purpose when the gift card falls out, ya know? Anyway, all that's left is to decorate! 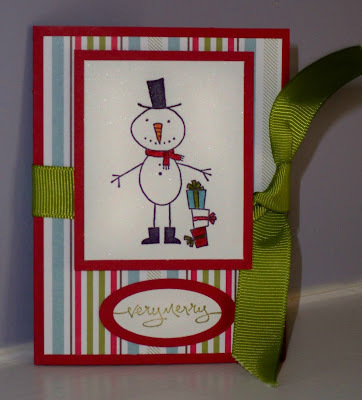 For this little cutie, I used a piece of Ski Slope Designer Series Paper for the background and punched the greeting with my Large and Small Oval Punch on Old Olive and Shimmer White cardstock. The greeting comes from the Short and Sweet stamp set - another MUST own - it's a great all purpose set! I stamped it in Old Olive ink. Mr. Twiggy is stamped in Basic Black ink on Shimmer White cardstock and colored in with markers and Blender Pens with ink refills. I adhered him to a piece of Riding Hood Red cardstock and popped him up on dimensionals. The Old Olive Wide Grosgrain Ribbon is just slipped under the stamped panel and tied around the side in a loose knot. See - I told you this was easy! The hard part is finding the right gift card to put in it! Now, you could choose to give a Stampin' Up! Gift Certificate - that would be fabulous! AND, I can help you with that too! Just shoot me an e-mail or give me a call. When you purchase a Gift Certificate from me to give at the holidays, I'll give your recipient Free Shipping when they redeem it! AND, make you a cool hand-stamped card to give it in too! See - EASY! Don't forget that you can beat the crowds and shop from my website HERE. Just click on the "Shop Now" Button at the top right corner and you go directly to the Online Ordering page. There you will find some fantastic specials and there are also lots of samples and ideas to inspire you. And remember, I'm giving away stamp sets during the Holiday Extravaganza Sale! I've given away several already today - are you next? he is pretty cute... Wink wink..
Great gift card Robin! I love it!